“Plutona will use the superhero genre as the entry point into a dark journey that explores the nature of friendship and good and evil, all through the eyes of five children alone in the woods," hinted Lemire. Lenox added: “The children in Plutona face some really dark situations and will realize that not everything is going to be okay. Don’t let the artwork fool you, this is not a children’s book. This is the kind of story I’ve been wanting to create for quite some time and am excited to do so with such talented folks like Jeff and Jordie." 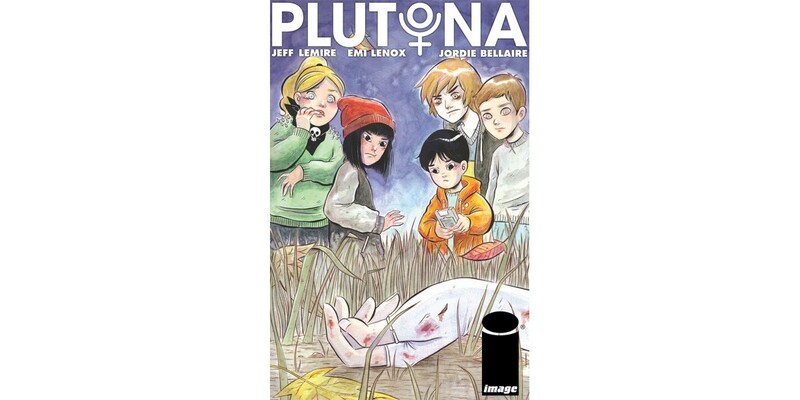 PLUTONA follows the story of five suburban kids who make a shocking discovery while exploring the woods one day after school... the body of the world's greatest super hero, Plutona, laying dead among the mud and grass. Led by the headstrong Mie and the troubled Teddy, the kids decide to keep their incredible discovery a secret, but it soon starts to tear their young lives apart, setting them against one another and pulling them into a darkness they may never be able to return from.